Page Street Publishing, 9781624143793, 144pp. Are you a home brewer who’s tiring of the usual suspects, cycling through the same styles and flavors? Are you a professional brewer who’s cranking through the same catalogue of beers year after year, just adding more hops with each rotation? There might be a bit of salvation here for you. Join brewer Butch Heilshorn and discover gruits: incredible botanical beers that were brewed throughout the world for most of human history. Butch provides techniques and approaches for the intermediate to advanced brewer to create these unique out-of-the-box brews. These increasingly popular beers use a wide array of plants, often local to the brewer, to delight palates and ignite imaginations. 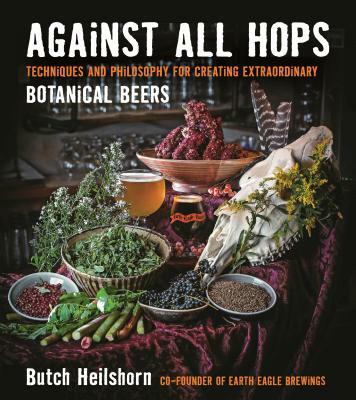 Butch’s philosophy espouses a practical reverence for the earth, a deep appreciation for the plants he regards as brewing partners and a decidedly anti-authoritarian streak, encouraging brewers to use his recipes as a jumping off point for their own adventures in botanical brewing—the ability to capture the essence of a particular time and place. YA BETCHA YOU’LL DIG THESE BEERS! George “Butch” Heilshorn and his brother-in-law Alex McDonald run Earth Eagle Brewings, a craft brewpub in historic downtown Portsmouth, NH.